Insights from the fields of neuroscience, biology, and cognitive psychology have yielded valuable strategies learners can use to better recall information, keep motivated, and understand their own learning processes. One drawback of such an abundance of learning research is that busy faculty members must follow multiple research fields, possibly far removed from their area of expertise, in order to keep pace with the latest pedagogical developments. 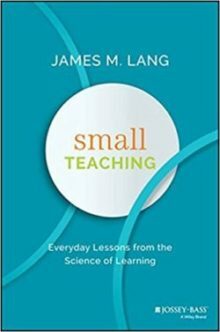 In Small Teaching, James Lang has synthesized various research, data, and findings into a set of nine discrete approaches with specific implementation suggestions for both face-to-face and online courses. The result is an accessible and realistic guide for making simple and effective changes in teaching practices for every experience and time commitment level. Another challenge is translating research findings into teaching practices or classroom activities faculty can implement without sacrificing too much time from their already hectic schedules. By adopting what he calls a “small teaching” approach, Lang recommends a number of brief (5-10 minute) classroom or online learning activities, one-time interventions, and small modifications in course design or communication. While these principles could still apply to a larger course redesign, the type of activities in Small Teaching lend themselves to quick mid-semester implementation. Each of Lang’s nine approaches are examined in their own chapters, which follow a common structure: Introduction, In Theory, Models, Principles, and Quick Small Teaching. The first three approaches’ chapters (Retrieving, Predicting, and Interleaving) fall under Lang’s broader category of Knowledge, which is broadly cast as the ability to critically analyze information, as opposed to simply memorizing facts. In these first three chapters, Lang draws heavily from Brown, Roediger, and McDaniel’s Make it Stick, as well as some other related studies. While Lang cannot replace the value of deeply engaging with all of this literature, his chapters are structured in a way that draws in the reader, helps them quickly grasp the research findings, and provides examples so they can develop teaching strategies. The first chapter, “Retrieving,” establishes the pattern followed in subsequent chapters by beginning with a personal anecdote to illustrate the learning approach in action. As with his other books, Lang’s writing style mimics that of a faculty mentor explaining his or her experience to a colleague. His explanations of research and concepts are similarly uncomplicated, such as stating the retrieval effect “means that if you want to retrieve knowledge from your memory, you have to practice retrieving knowledge from your memory” (20). This and other self-described simple definitions are accompanied by more technical explanations and citations, however, clarity and directness are at the forefront of Small Teaching. 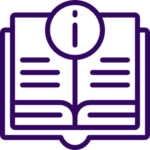 The retrieval models section includes opening/closing questions, frequent low-stakes quizzing, and ongoing syllabus retrieval activities. Each of these activities are described in a fair amount of detail, including references to the underlying theories, and assessments of their effectiveness for long and short term retention. The remaining principles, quick tips, and conclusion sections of the chapter are more general than the earlier theory and models sections, and might be less immediately helpful for many readers. However, the repetition and summary inherent to this chapter structure may serve to reinforce key points and add clarity. Given its breadth, most teaching faculty will find something of value in Small Teaching. While the models and quick tips in each chapter will provide the most immediately practical takeaways, the long term benefits of this work will come from continuing faculty engagement with the scholarship and methods underlying the teaching and learning practices. The following outline of the structure and content of Small Teaching should help an instructor quickly locate sections of the book helpful for his or her teaching.